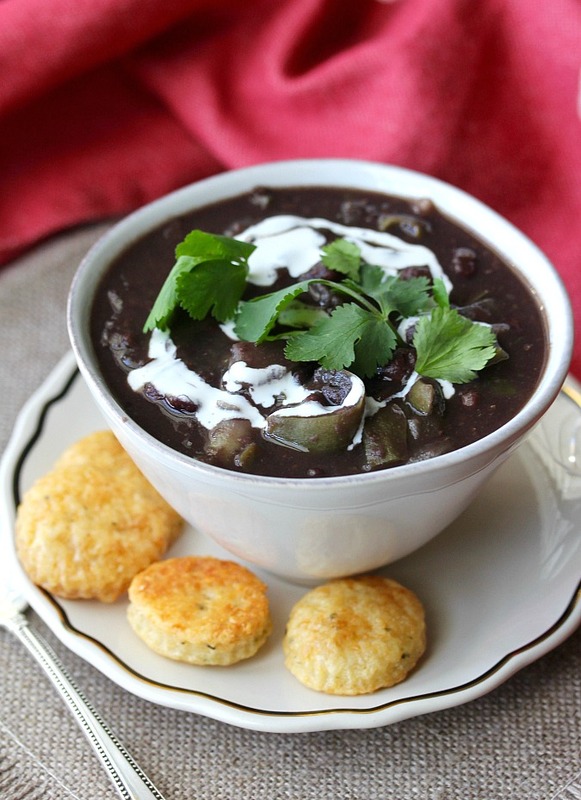 This Cuban-style black bean soup may look like a simple bowl of soup, but it is much more complex. The ingredient list is long, but the flavors in this soup make it worth the fuss. 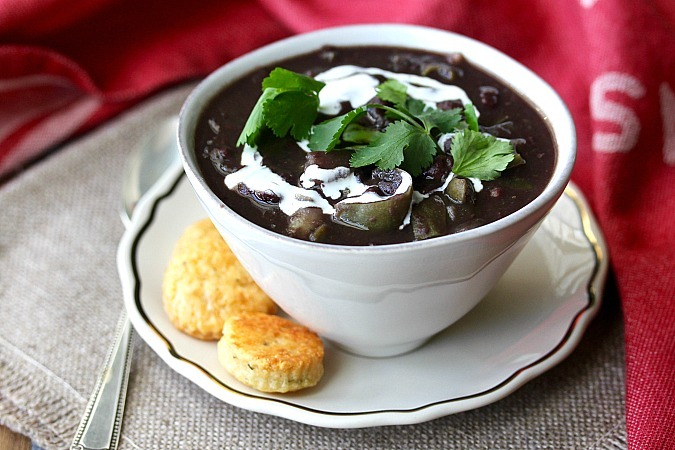 Along with the black beans, this Cuban-style black bean soup is flavored with bell peppers, onions, jalapeños, garlic, cumin, oregano, and Manzanilla olives (the kind you put in martinis). This recipe for black bean soup calls for soaking dried beans overnight with water and bay leaves before cooking the next day. It's a surprisingly easy process even though it might sound complicated. This was my first time making a black bean soup using dried beans, and I was super happy with the results. I garnished this soup with Mexican crema and cilantro leaves. If you can't find crema, just dilute some sour cream with a bit of milk to drizzle over your bowl. Are you curious about those crackers? They are sourdough crackers with Gruyére and thyme. Delicious. 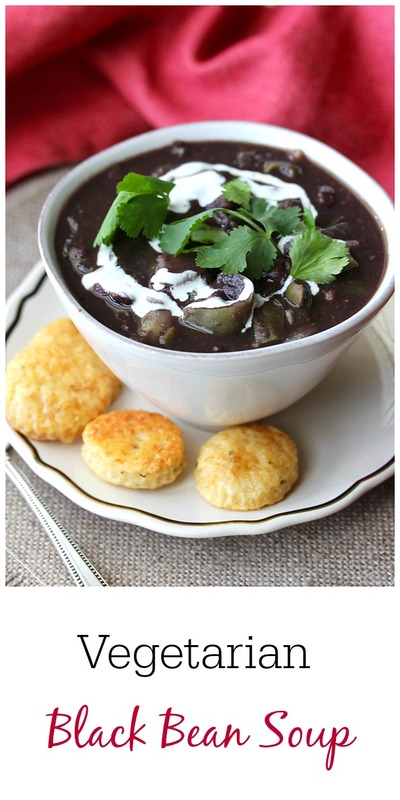 You don't have time to soak the beans to make this but you are still craving a black bean soup? Try this Smoky Black Bean Soup. It's ready in 30 minutes. This month, the Soup Saturday group, hosted by Paula of The Saucy Southerner, is going meatless. After the recipe, be sure to check out the rest of the Soup Saturday recipes. This recipe is adapted by David Lebovitz from Cuba! Recipes and Stories from the Cuban Kitchen. The book is filled with fabulous recipes. 2 bell peppers, stemmed and seeded. One cut in half, one diced. 2 medium onions, peeled. One halved, one diced. In a Dutch oven, add the beans, water, and bay leaves, and soak overnight. The next morning, add the halved bell pepper and halved onion to the Dutch oven. Bring the mixture to a boil and then lower the heat to a simmer. Cook, partially covered, for about an hour. Halfway through, skim off any debris from the top and stir in a teaspoon of salt. In the meantime, in a skillet, heat the olive oil and add the diced pepper, the diced onion, one teaspoon of salt, and some freshly ground black pepper, and cook for about 5 minutes. Add the garlic and jalapeños and cook for another minute or two. Add the cumin and oregano and cook for one more minute. Turn off the heat, add a bit of water and quickly deglaze the bottom of the pan to scrape up all of the browned bits. Set the pan aside. Once the beans are done, remove the bay leaves and pieces of halved onion and bell pepper. Discard the bay leaves and puree the onion and bell pepper in a blender or food processor, along with 2 cups of the cooked beans. Add this mixture back into the Dutch oven. Add the red wine vinegar, chopped olives, and the reserved cooked onions, pepper, and spices. Bring everything to a boil, and then reduce to a simmer. Simmer for about 20 minutes. Season with salt and pepper to taste. Garnish with crema and cilantro. Black bean anything is my favorite! You couldn't have come up with a soup that would be more popular at my house. I have never considering the addition of olives....I must give it a try. Thanks Kathy. The olives aren't noticeable per se, but they add a certain brininess. Really tasty. Interesting addition there with the olives. I will have to try this. Thanks Karen. They're great for using up sourdough discard! One of these days, I'm really going to have to break down and make a black bean soup!!! Especially after seeing this great recipe! 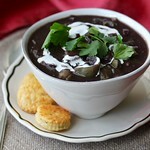 I love black bean soup- this looks fantastic! I have black beans but have never tried it in soup. It sounds delish Karen! Thanks! You must give it a try.